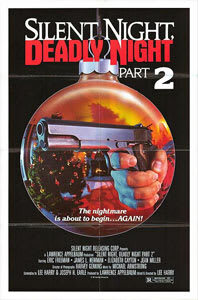 Have you seen the original Silent Night, Deadly Night? Well, Part 2 contains 45 minutes of footage from the original in flashbacks, so you don't have to. The hero of the film, Eric Freeman, is a man who acts with his eyebrows and is incapable of subtlety. Instead of watching this whole movie, just type in "GARBAGE DAY!" on You Tube for some unintentional comedy gold.